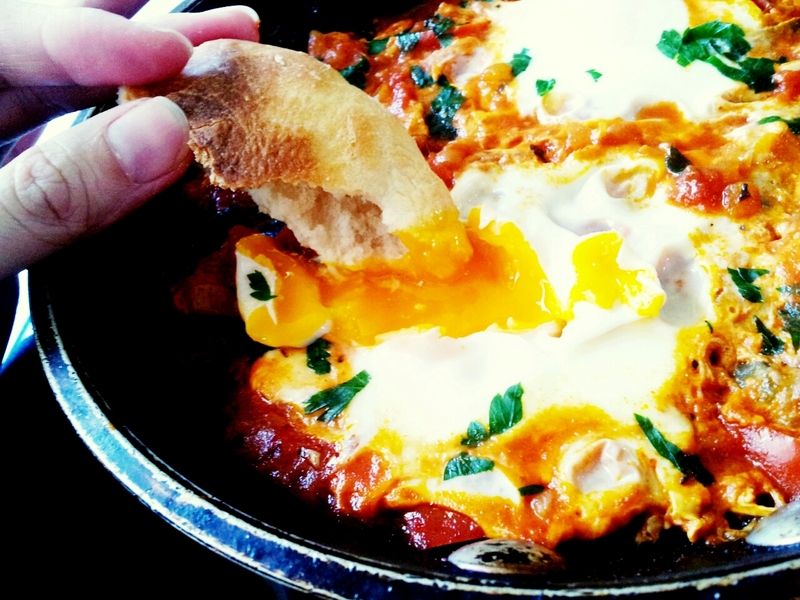 Glorious Shakshouka, perfect to start your day with. It’s not the first time I’ve proclaimed my love for eggs here. This blog should be called Kelly Siew Loves Eggs. Or something like that. I’m not very imaginative when it comes to names. And when it comes to egg dishes, Shakshouka would probably be top the list, excelling both the aesthetic department, and taste. 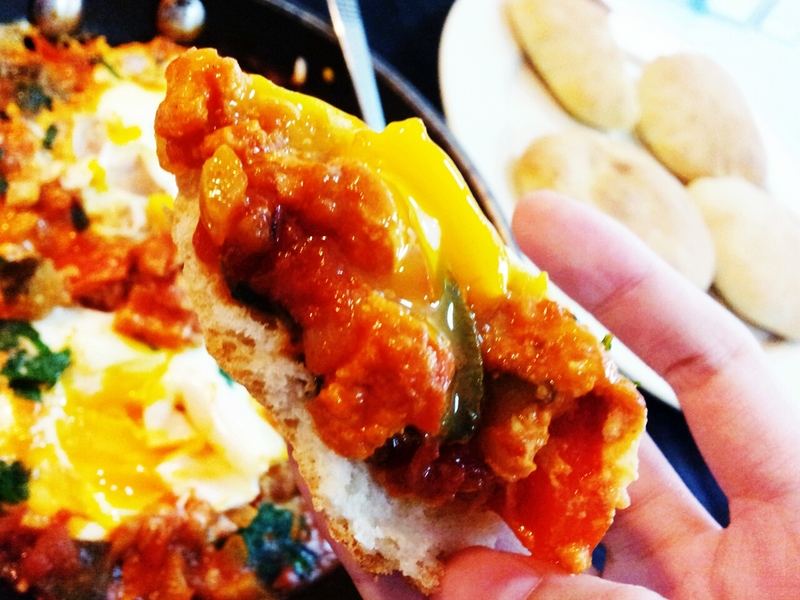 I’m not certain where Shakshouka originally came from (Tunisia? Algeria? Wiki says both) but it’s become a staple for quite a few countries. One thing we know though is that the Arabs really knows how to make an egg dish shine! Shakshouka, meaning ‘a mixture’ is a dish where eggs are poached (or baked, sometimes) in a spicy tomato based sauce with various vegetables, most commonly capsicums (red & green pepper), and enhanced by the aromatic paprika, cumin and garlic. It’s no surprise that this dish has recently taken the world by storm. And many variations have since sprouted too. The Spanish Baked Egg I’ve blogged about a while ago would be one example. Not only this is extremely satisfying, it’s also really good for you! Definitely my kind of dish. Who needs the bacon when you have this? In a large pot, heat a little olive oil and stir in the onions and garlic, cook until soften. Add capsicum and cook for 1 minute or two. In another pan, dry roast paprika and cumin until fragrant, then add to the vegetable pot, follow by the tomatoes and chili. Cook for about half an hour, stirring regularly, and season to taste. Add the hot sauce and cayenne pepper at this point as well as half the chopped parsley. If the mixture is starting to look dry, add water as needed. For smaller serving: In a small cast iron pan , add just enough vegetable mix to about two-thirds. Crack one or two eggs (or more, if larger serving) into the dish and sprinkle with chopped parsley. Cover and poach eggs for about 3-4 minutes until the eggs are just set. If you plan to serve a large crowd, you can use the big pan and just crack more eggs into the sauce. Cooking time for the eggs would be the same. Of course, you can always pull back the heat by adjusting the amount of cayenne pepper. 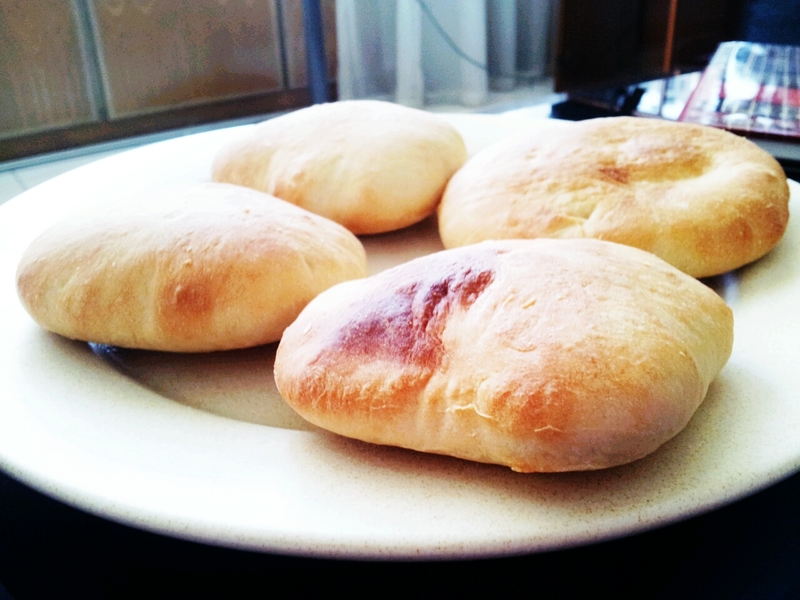 I’ve also made some pita bread to go with the Shakshouka for an authentic experience. In a large bowl, whisk flour with salt. Make a well in the centre and pour in the yeast mixture. Using a dough scraper or a spatula, mix until a dough forms. Turn the dough out and knead for good 10 minutes until smooth and elastic. Shape dough into a ball and left in the large bowl, cover with dish towel and left rise for 1 hour or until doubles in size. Preheat the oven to the hottest setting (250 degree Celsius usually). Leave a baking tray in there to preheat too. Divide the dough into 6 to 8 rounds (depends what size you prefer), and roll out to about 1/4 inch thickness. Let rise for another 15 minutes or so. Once the oven is hot enough, working quickly, bake each rounds for 4 minutes each side or until lightly brown. If all goes well, the bread will puff up! And you’ll have pita pockets like this. Now, there’s only one thing left to do. Gotta love the runny egg yolk! What are you waiting for? Make it tomorrow! Please invite me for your breakfast…. This is amazing. 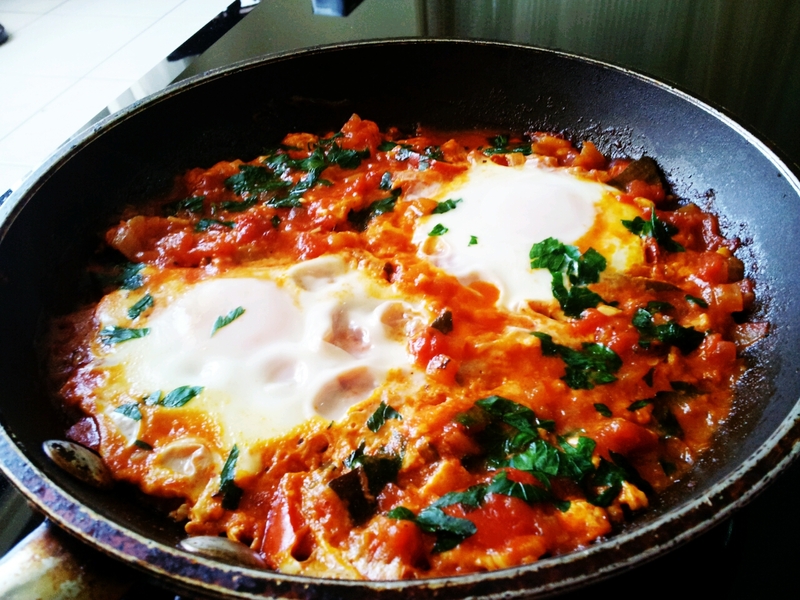 I have never heard of shakshouka but it doesn’t matter, this looks DELICIOUS. 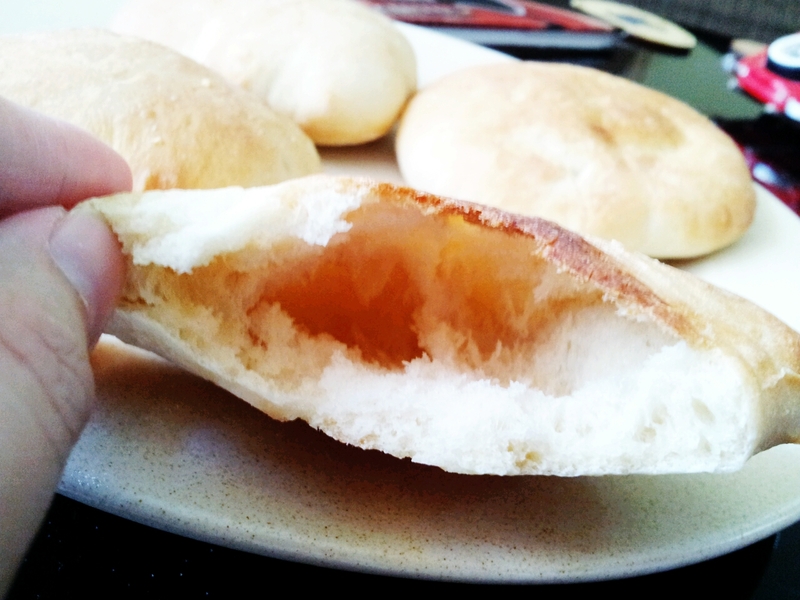 I’m swallowing my saliva here… and to make me even more jealous you made your own pita bread! What a perfect meal. I know this is so worth making it. I usually eat big breakfast and this is perfect!! Definitely The Breakfast of Champions. Wanted to lick plate clean. So Good. Says a Born Again Fan of Runny Eggy Yolk etc. Loved this so much. I guess usually it’s just called baked eggs (as long as it’s in a spicy tomato and pepper sauce). Definitely easier to pronounce and straight to the point. But I’m a sucker for fancy names. Especially in foreign language. Hehe.